I have been blogging for a year and half now. A lot of learning, growth, healing and connection has happened in that year and a half. 197 posts of learning, growing and healing to be exact. As I am continuing to work on growing the platform of Ever Upward, I am growing my Justine Froelker’s YouTube channel. You can find Self-Care Tip Tuesdays, funny videos of the dogs, tapping scripts, my appearances on Great Day St. Louis and videos of me speaking to old blog posts, so please subscribe! I originally wrote Living Wholehearted With Perspective Not From Comparison in January of 2015. This is a slightly reworked and updated version of it, along with a NEW video explanation. Twice in one year I had to go back to work as the authentic therapist I am after being out from a family member's life threatening, and ultimately life changing, accident. I had to pray before each session and take a deep breath in order to be present for my clients and to not compare my hard with their hard. I had to have the conversation with my clients that they are still allowed to their struggle even though they knew what I had been going through. In one year's time we had two of our closest family members, my dad and Chad's sister, suffer life threatening and forever life changing medical traumas. During this time I learned how to allow myself struggle while helping others through struggle, I learned more in the hard life lesson of letting go of comparison and I grew even more into my wholehearted life. This is living life in the wholehearted way. Sure there is life or death but hard is just hard. This is perspective. What I think we must remember is to practice this wholeheartedness with perspective but not through comparison. This comparison comes up a lot in the practice of gratitude. Practicing gratitude has been something I've taught to my clients for years at this point. Practicing gratitude has years of research to support the positive benefits of it. Practicing gratitude has been tweaked and improved by many of my favorite people such as Sonja Lyubomirsky, Marie Forleo, Brené Brown, Gabrielle Bernstein and Elizabeth Gilbert. I write about the different ways I practice gratitude myself and what I teach my clients in Chapter 4 - Choosing Change in Ever Upward, especially in gratitude journals. Which you can guess are usually received with an audible groan and rolling of the eyes. But, it works! I promise! What I have learned since writing the book is that I need to check my intentions when practicing my gratitude. I need and want my gratitude to come from a place of wholeheartedness. I need and want my gratitude to come with perspective and not from comparison. We've all heard the sayings, be thankful someone always has it way worse than we do or it could be worse. I think practicing gratitude from this place of comparison is not healthy for us. And I know for sure, that practicing gratitude from this place of comparison, especially when coping with anxiety or depression, only makes it worse. Practicing gratitude from comparison leaves me asking myself, "Why can't I just be happy?" Which, ultimately, only feeds the depression. Of course, things could always be worse. Trust me, half the time I've survived the worse. However, I must choose to practice my gratitude from the intention of a new perspective and not from comparison. Whatever our hard, it is all just really hard. Sometimes, hard is actually life or death. But, all the time it is the life or death battle of losing ourselves. It is true, comparison is the thief of joy, happiness...really of all good. Check your intentions as you practice your gratitude, better yet as you live your life. Live wholehearted from the lens of a new perspective but not in the darkness of comparison. I promise you will feel the difference immediately. 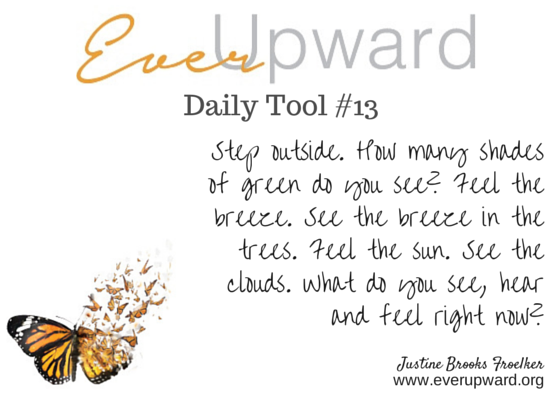 I promise your ever upward will come into full focus for you to walk into and fully embrace.